Winnow`s co-founder Marc Zornes signed a Memorandum of Understanding (MoU) with the Dubai Municipality. It aims to encourage the use of technology to reduce food waste across the hospitality sector in the UAE. The initiative is part of the Dubai Municipality's efforts to shift 75% of the waste produced in the country from landfills. The move is also in line with the targets of the UAE's 2021 National Agenda. The agreement was signed last week, during the conclusion of the second round of the Dubai Future Accelerators (DFA). A total of 28 MoUs were signed between government departments and innovative companies from around the world. The closing ceremony was attended by the H.H. Sheikh Hamdan bin Mohammed bin Rashid Al Maktoum, Dubai Crown Prince and Chairman of the board of trustees of Dubai Future Foundation. The DFA connects emerging technology companies with Dubai government bodies. The goal is to test new approaches capable of solving problems that are expected to arise in key sectors of the economy. "The Dubai Future Accelerators program sets an example and a business model where various sectors – public and private – can come together to find ways to face the challenges of the future, and benefit from the opportunities to secure sustainable development and prosperity for future generations." Said H.H. Sheikh Hamdan in an interview to the DFF. Food waste is a huge and costly problem to the UAE. The country wastes around 3 million tonnes of food every year. It costs the economy an estimated of $4 billion. Food waste presents a key challenge to the country's rapidly growing hotel and catering sector. But, there is an enormous savings potential for the industry in addressing the issue. Winnow`s cutting-edge technology has been helping large hotels in the UAE save more than $35,000 per annum in food costs. This reduction in food waste has translated into a saving of an estimated 33 tonnes of food from landfill and an equivalent of 231 meals saved each day in Dubai. At the moment, we are operating in seven hotels in Dubai, with 20 new contracts to go live in the coming months. The Pullman Dubai Creek City Centre & Residences was one of the first hotels in the region, that adopted our IoT technology. The hotel achieved 4% reduction in food purchasing cost in only 4 months. The initiative is part of the AccorHotels’ Planet 21 programme that aims to reduce food waste by 30% by 2020 across their entire portfolio of hotel brands. 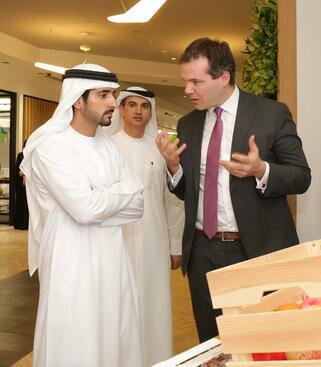 Following on from the DFA programme, Winnow is establishing its regional headquarters for the Middle East in Dubai. By directly investing the region, we be best placed to support our agreement with the Dubai Municipality. Also we will be able to keep helping the country reduce its food waste.